In the resolution’s crosshairs: Antifa and other left-wing activists involved in attempts to obstruct U.S. Immigration and Customs Enforcement (ICE) operations and encourage harassment campaigns against ICE employees. More pointedly, the resolution condemns by name the Democratic politicians who have made common cause with them. Also specifically named are New York Democratic candidates Cynthia Nixon and Alexandria Ocasio-Cortez, running for New York Governor and the U.S. House, respectively, and both ardent supporters of the Abolish ICE movement. The Hollywood Reporter learned this month that Ocasio-Cortez, riding the wave of popular attention from her winning her party’s nomination over long-time incumbent Rep. Joe Crowley (D-NY), made common cause with one of the most radical groups working to undermine federal immigration enforcement, holding a fundraiser with Occupy ICE LA. She made the decision to do so after the same group used its Facebook page to call ICE Enforcement a “genocidal ethnic cleansing machine” and liken its employees to Nazi Germany’s Gestapo. No other senators have thus far announced plans to sign on to Cassidy’s resolution. A previous attempt at a congressional resolution to support ICE in the face of the Abolish ICE movement, which on its own terms would effectively end systematic interior enforcement of American immigration laws, passed the House of Representatives in July. Senate Democrats, led by Wheeler’s fellow Oregonian and anti-immigration enforcement stalwart Sen. Jeff Merkley, shot down a companion resolution in the Senate before it came to a vote. 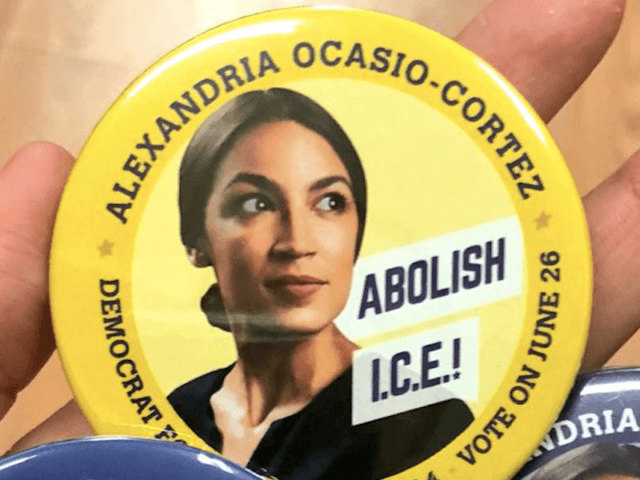 The votes above forced elected nearly 200 elected Democrats to explicitly oppose condemning abolition of ICE, showcasing the growing, open support for abolishing ICE among more than simply left-wing outsiders like Ocasio-Cortez and Nixon. The street activists of the extreme left have long called for ending all immigration enforcement, but have been ignored by the mainstream Democratic Party, whose voters remain deeply opposed to such a policy. With this most recent outpouring of “Abolish ICE” enthusiasm, however, elected Democrats like Sen. Kirsten Gillibrand (D-NY), New York City Mayor Bill de Blasio, and Rep. Mark Pocan (D-WI), perhaps feeling they knew which way the political winds were blowing, rushed out onto a limb to endorse the movement. Even veteran left-wingers like Sen. Bernie Sanders (I-VT), California Lieutenant Governor Gavin Newsom, and Sen. Kamala Harris (D-CA) were reluctant to cave to the immense activist pressure to join them. With Sen. Cassidy’s resolution, the Senate GOP may be setting up yet another sounding of the Democratic benches on the issue, seeing how many will stand with the Abolish ICE movement and how many, if any, will break ranks with their colleagues who have already thrown in with the activists working to obstruct and harass federal agents.